3.74" x 1.97" x 0.57" 14.5 x 10 x 2.5cm 5.0" x 7.1" x 11" 5.5" x 3.6" x 1.18"
Not completely content with rubber’s above-average durability, Corsair has decided to go all out with their Flash Survivor rugged series. Forged from aircraft grade aluminum in the CNC mills of Mount Doom, California, this drive is designed to take a beating while providing transfer speeds unfathomable by mere I/O controllers. The Corsair Flash Survivor lived up to its name, after being submerged in 12′ of chlorine water, chucked from a roof and backed over by my SUV multiple times. And while the tube housing may not have met our expectations with its flying endcap, it did protect our data, and Corsair’s generous 5-year warranty will grant it a new lease on life. The Survivor is definitely for those with active lifestyles. G-technology – a brand under Western Digital that targets on-the-go photographers and video professionals alike – has a moderately rugged portable SSD that keeps up with today’s demand in performance and also data protection against different working environments. Its G-Drive SSD R-series is rated for IP67 rating which means the drive offers protection against dust and immersion up to 1m. G-technology also claims the chassis is able to withstand drops from up to 3m and to resist pressure up to 1000lb. In addition to durability, the G-Drive offers superb performance (up to 560MB/s) via its USB 3.1 Gen 2 interface over USB-C. This kind of speed should be fairly future-proof for most people needs unless you are trying to edit RAW 4k footage in real-time. G-technology doesn’t include free data recovery services with the G-Drive but offers 5-year limited warranty with the product. You can find the rugged drives available from 500GB to 2TB. This ioSafe really is a triple threat. It offers stellar performance; exceptional protection; and great aesthetics. The chassis is designed to take all the beatings so the hard drive inside can survive. This means that no matter how extreme a situation you encounter your precious data is going to be as safe as it could possibly be. 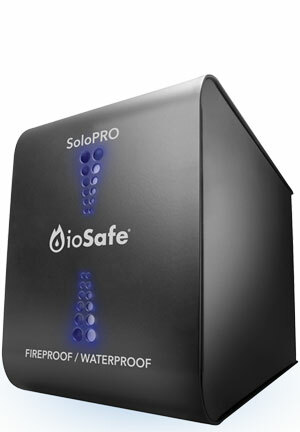 Even in a worst case scenario, your data will be safe and sound; or at the very least, the ioSafe has a much better chance of surviving the disaster than you will. As long as you are willing to pay more per gigabyte than you would for an unprotected portable drive; and as long as you don’t mind it being slightly less portable than an unprotected drive, the ioSafe Rugged Portable would be a great choice. The LaCie XtremKey has already made a name for itself as one of the handful of flash drives being able to survive pressure, water, heat and cold. 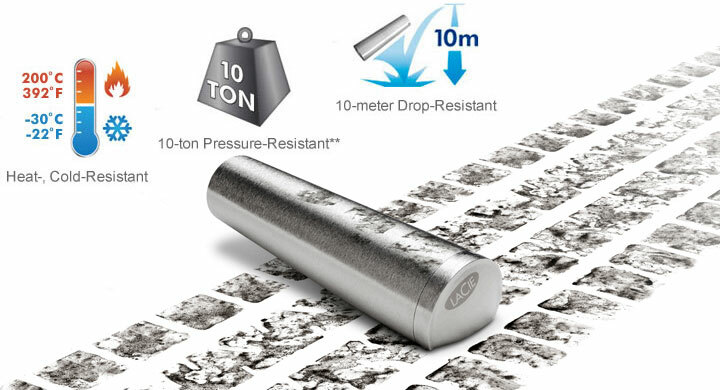 LaCie claims it can resist temperature as high as 200ºC; 10-ton pressure; 10m drop; and submersion in water up to 200m. The latest addition of USB 3.0 to the already formidable-looking drive should only make the XtremKey more desirable. LaCie advertises the rugged drive performance with an impressive 230MB/s read speed. If manufacturers don’t make the write speed public, you can usually expect it to be only half of read. Regardless, the new XtremKey should still leave the original version with its 30 to 40MB/s average speed in the dust. Little else has changed in the fundamental design, retaining its heavy-duty screw-tight enclosure made with 2mm-thick ZAMAC metal alloy. LaCie offers 32GB as minimum capacity with a starting street price of $45 up to 128GB for $110. But the company stops making them so try your luck on Amazon and eBay. These are 5 most rugged USB personal storage solutions we’ve found so far. We hope you find them useful. If you are using some other products that aren’t lised here, let us know if the comments below.